Few videogame franchises have lasted as long, or been through as many changes, as Resident Evil. The vaunted series has been throwing zombies into bullet paths for almost two decades now, and the only pile higher than the bodies is that of the games themselves. After the initial success that was the first Resident Evil in 1996, Capcom knew that it had the beginnings of something special and began work immediately on a follow-up that would enhance upon the original’s formula and provide new,ahem, blood. In January of 1998, Resident Evil 2 launched for the Sony Playstation and dropped eager gamers directly into the nightmarish aftermath of an outbreak in Raccoon City. Players were offered the choice of two character to choose from, Leon Kennedy or Claire Redfield, and both offered different play through experiences. RE2 wasted no time in throwing players into the action, as the game literally begins with you surrounded by zombies after a car wreck and explosion. From that point on it is a battle for survival against monstrous hordes as you make your way through Raccoon City and unravel the mystery of the outbreak and the involvement of the nefarious Umbrella Corporation. Playstation owners had another hit on their hands, and Nintendo 64 fans were left to look on in utter sadness. 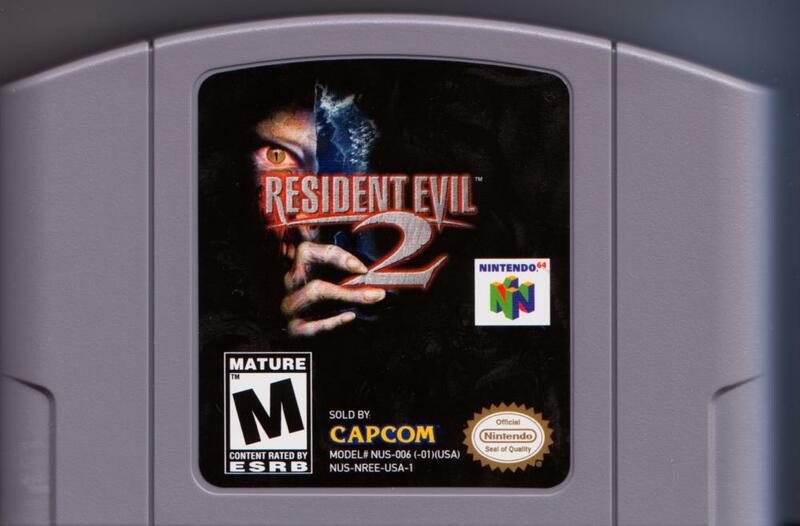 Capcom listened as gamer’s cried out for a port to Nintendo’s blocky console however, and on Halloween of 1999 Resident Evil 2 blasted it’s way onto the N64 with all the blood, guts, and bullets Nintendo fans had been clamoring for. The fact that this game was able to be squeezed down into the limited memory of the N64 cartridges is a technical achievement within itself. Making use of the N64’s expansion pack, the graphics and character animations all look great and flaunt slight improvements over the Playstation version. While the FMV sequences and pre-rendered backgrounds look better on the Playstation, the N64 was able to hold it’s own and boasted a great looking port packed into one of the largest cartridges (memory wise) that Nintendo would allow to be built. The port even boasted extras such as costumes, a randomizer mode that changed the location of keys and items each playthrough, and additional story elements that tied RE2 to other games in the series. The original elements of Resident Evil always hovered around tense inventory management, limited ammunition, and complex puzzles all wrapped up in a horror film-esque atmosphere. Later releases in the series, Resident Evil 6 and Operation: Raccoon City, seem to have lost this in favor of turning the franchise into military styled action games that happen to also include zombies and viruses. While those are decent games in their own right, I personally enjoy the classic Resident Evil titles, and Resident Evil 2 provided a good amount of jump scares and survival horror goodness. The game was also later ported to the Sega Dreamcast, Nintendo Gamecube, and the Tiger Game.com, but feel free to totally skip the Tiger version. Resident Evil 2 can be found pretty easily today, with maybe only the Dreamcast and N64 versions being slightly rare and more expensive. If you get a craving for classic survival horror days, you won’t be disappointed in taking a bite (sorry) into this Retro Game of the Week. Greg Hanks liked this on Facebook.